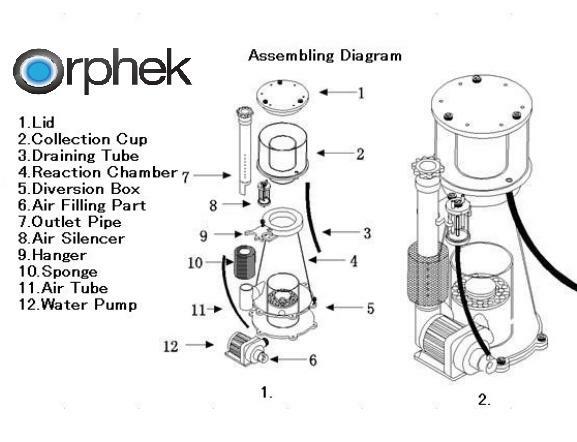 Orphek Helix 3000 Protein Skimmer Design vastly improves contact time in the reaction chamber while producing an enormous amount of very small micro bubbles. The increased amount of micro bubbles results in more waste being collected per hour than any other conventional protein skimmer on the market. Pure acrylic used for reaction chamber, riser tube, and cup. Pmma castings used for all other components. Cone shaped for improved concentration of foam to the riser tube and collection cup to provide a fast and more efficient removal of waste from your aquarium. A controllable 3,000 L/h DC pump provides a high speed, high volume cylindrical movement of bubble rich water. With a DC pump and controller you can now take full control of your skimmer to give you exactly the skim you are looking for. The pump impeller was designed to spiral the water/air mixture created by the needle wheel to further reduce of the bubble size created by the needle wheel. This provides a water column exiting the pump with an enormous amount of micro bubbles. 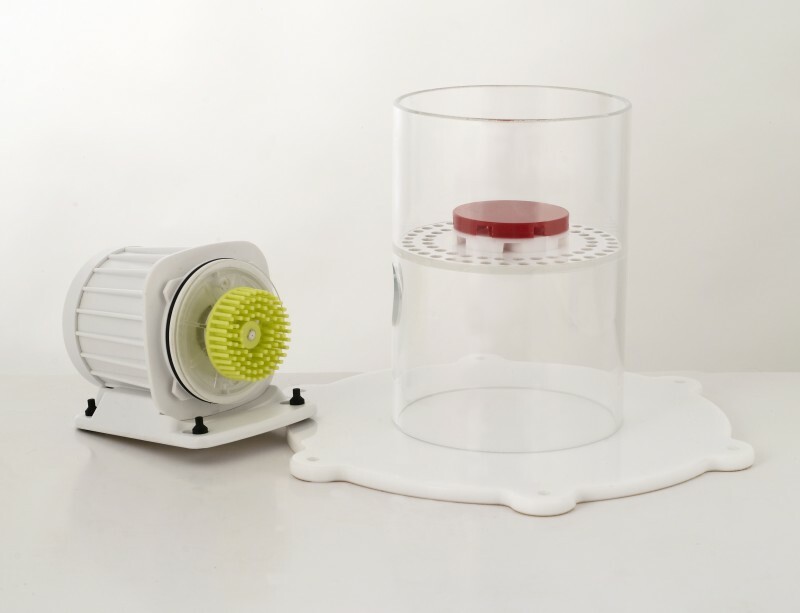 The specially designed bubble plate diffuses the bubbles and reduces turbulence of the water entering the conically shaped riser tube which helps prevent premature break down of the nutrient rich bubbles entering the riser tube. The controllable DC pump provides a highly efficient means for moving large volumes of water with little energy cost. This also means less heat transfer into the aquarium. The Orphek Helix Protein Skimmer has been perfected and tested for 1.6 years on a tank much larger than what it is rated for. This ensures optimum efficiency and reliability of all components and assures you a clean and healthy tank. 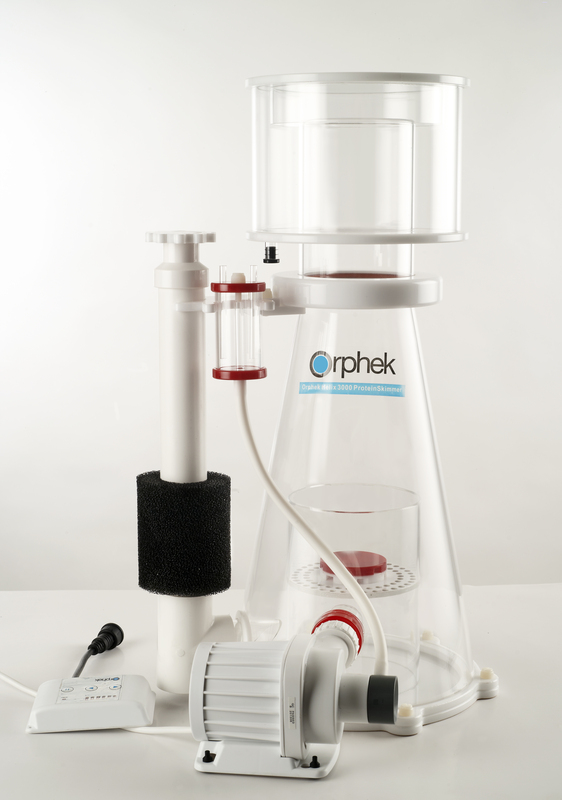 The new Orphek Helix Protein Skimmer removes more waste than any other skimmer in its class and will easily create a nutrient free aquarium providing ideal water conditions for coral growth and health. 1. Keep reaction chamber (4) and diversion box (5) aligned before locking. 2. Place outlet hanger (9) on top of reaction chamber (4) and lock in place. 3. Put sponge on outlet pipe and secure with hanger (9). 4. Connect air silencer (8) with air line and fasten to hanger (9). 5. Connect collection cup (2) with drain tube (3) before inserting it into the reaction chamber (3) and place lid (1) on collection cup (2). 6. Connect the air line to the inlet of the water pump (6), keep outlet and reaction chamber ports aligned before installation to the diversion box (5). Be sure air line is connected firmly to the air silencer (8) and pump inlet (6). 7. A new skimmer will produce much foam during break in due to manufacturing processes. Please adjust water volume control with knurled knob on the water pipe. It should be initially adjusted so there is a very small amount of foam entering the collection cup. Air flow can be adjusted similarly with the adjustment screw on the air silencer. After the break in period (1 – 2 weeks) you can adjust the water flow and air to produce the desired skimmate. You can also adjust the pump volume with the pump controller. 8. Turn on the power by pressing “+” on controller, one light on indicates speed/RPM, continue to press the”+” button to increase the water volume you desire. Pressing “-“ button to decrease water volume. 9. Press “Feed” button for a 10 minute pause, “10 min” light will be on and pump will resume in 10 minutes. Pressing the “Feed” button again will end “Feed” mode.